Fans behind him look stunned. 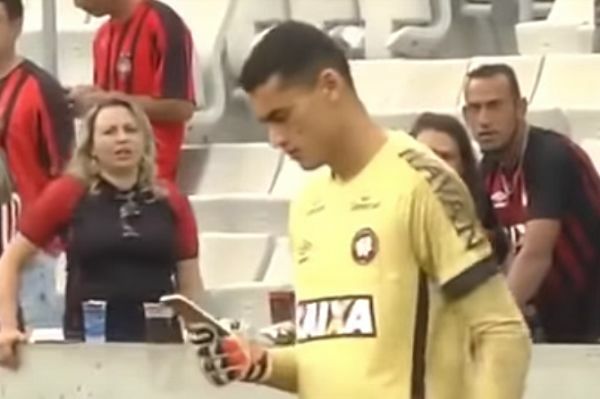 Atlético Paranaense goalkeeper Santos checked his phone in the middle of a Brazilian Série A match at home to Atlético Mineiro. Such a stunt would look bad in Sunday League football, let alone Brazil’s top flight, so we can only assume he had a very good reason to be keeping his mobile handy. As you can see from the stunned reaction of fans behind him, it was a far from reassuring play from their last line of defence. He puts it away as soon as he senses an opposition attack building, but that wasn’t enough to save his side from a 1-2 defeat.